Recently I’ve found a couple of services that allow you to rent time on telescopes located in dark sky areas which are set-up for automated remote observation. 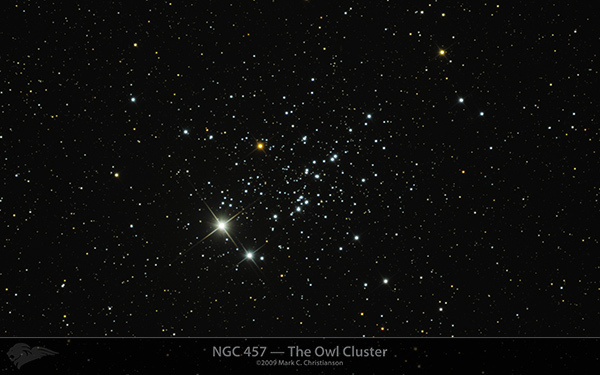 For my first target, I picked an open cluster in Cassiopeia called NGC 457, often called the “Owl Cluster.” It was taken on a 12″ telescope located in New Mexico. It’s certainly not a perfect photograph, and I’m very much learning the techniques of both acquiring image data and the processing of that data into the final images (much of which remains a mystery to me), but I’m fairly pleased with the result. Hopefully soon I’ll have another image to share. The next target is intended to be the Trifid Nebula in Sagittarius (also called Messier 20 or M20).